This novella for middle grade readers (ages 8-12) features Harley, an adventurous and charismatic black cat, and Angela, his beloved feline companion. On vacation in Rome, they unwittingly discover and then must end a centuries-old global war between cats and dogs. 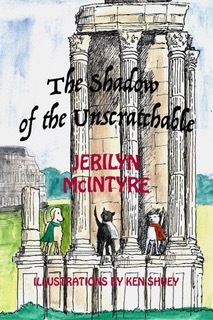 Mysteries and magical moments abound, but they join forces with Friskie, an affable mutt they encounter in the Roman Forum. They must also enlist the support of a feisty band of feral cats. Above all of the action looms the ghostly figure of Prudens Poochie, a Pomeranian who forecasts a disastrous outcome for dogs and cats worldwide if Harley, Angela and Friskie don't succeed in their mission. Jerilyn McIntyre is a retired university professor and administrator, and now an independent author. The Shadow of the Unscratchable is her second of two novellas for middle grade readers, chronicling the adventures of Harley T. Katt , a charismatic black feline and his companion, Angela. The first book in the series, Paws in the Piazza, follows Harley and Angela as they find intrigue and romance in an enchanted Venice. The Shadow of the Unscratchable finds them caught in a mysterious and magical dilemma in Rome. McIntyre's other writing includes personal essays and memoirs reflecting on her life as a child in Nebraska during and after World War II, published in several small literary journals.